In November, the Chancellor set out how the Government plans to achieve a £20 billion reduction in spending, as part of the 2015 Spending Review. As the Prime Minister has said, this challenge demands that the UK develop ‘a smarter state’ – built around the principles of reform, devolution and efficiency. The New Year brings opportunities to secure these savings and essential reforms to improve public services. The Government Finance Function has a central role to play in ensuring you and other officials succeed. The preparation to put expertise and support in place across Whitehall began two years ago, with the Government’s review of financial management. This was a call to arms to improve financial management in every department. Its central aim was to ensure finance has the right people, operating model, data and tools to deliver public sector reform and better public services. A crucial part of this programme is working with front-line officials and others to better understand and analyse the cost of public services. This includes a forensic understanding of cost and cost drivers to understand: both what we spend and what we get for it. This knowledge – what drives costs, why they vary and why they change over time – is essential to highlight the most effective and sustainable ways in which the Civil Service can achieve essential savings in the years ahead. The Financial Management Reform programme has a new dedicated team based in HM Treasury (HMT), who undertake ‘Cost Reviews’ as a practical way to achieve this. Working closely with departments’ finance, strategy, analysis and policy teams, the reviews have examined different areas of public spending. In particular, they have focused on taking a whole-system approach to services being delivered across organisations to break down silos. 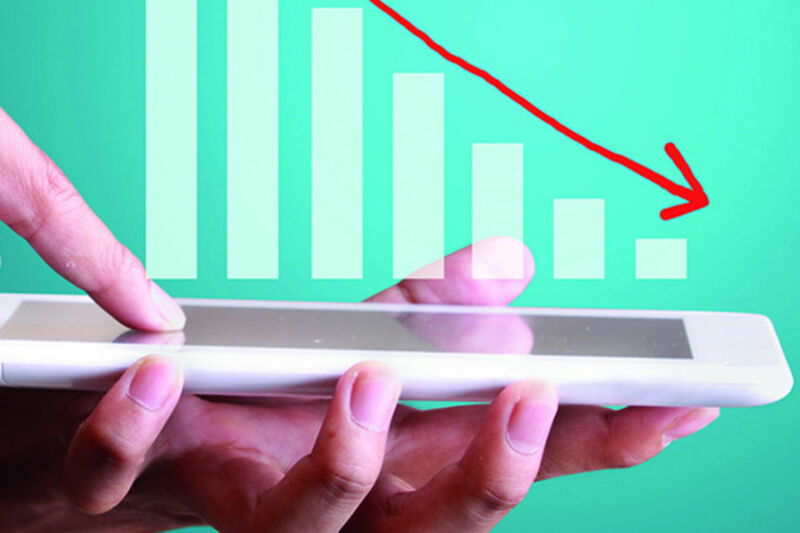 By using existing financial and operational performance data to provide new financial-based insights, the reviews increase understanding of costs and opportunities for benchmarking and find new, smarter ways of working. Further Education (FE) is a large, varied and fragmented sector. With that in mind, the review team started by comparing the financial health metrics for over 1,200 FE institutions, looking in detail at cost breakdowns for 341 colleges and visiting 20 providers. From this work, they identified significant variation in the profitability of institutions, driven by differences in costs and income. For example, administrative costs vary between 10 and 28% of total FE providers’ income. Almost half of providers’ income is spent on teaching staff, the main cost driver. Digging deeper into a sample of 20 institutions, the team identified what colleges have done to achieve low costs. Firstly, they manage their staffing mix to make the most of cost-effective learning support staff. Secondly, they actively control their costs per teacher, for example, by making greater use of high performing staff from lower tenure pay bands. Finally, they achieve a positive balance between optimum class size and teaching quality, for example, combining learners from different, but similar courses for some classes to help maintain larger class sizes. 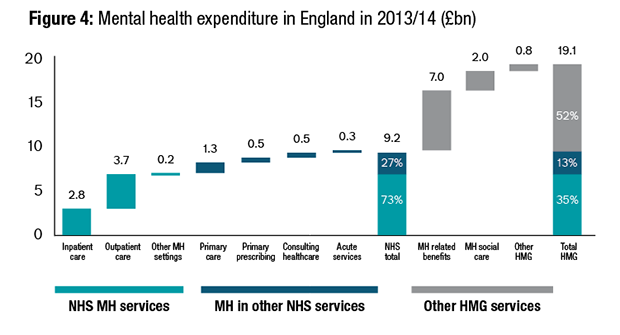 This review examined the cost of providing mental health services in England, looking across health, social care and welfare silos. This starkly showed – for the first time – the significant impact of both welfare payments in supporting people with mental health issues and the contribution of unpaid care. Taking a whole system approach highlighted that one million people with mental health issues receive Employment and Support Allowance, but employment schemes are not tailored to people with mental health issues. This suggests we can improve outcomes and opportunities for people in considerable need, by looking across the health, social care and welfare landscape (See Working for better mental health). The Review also identified large variation in the unit cost of provision of similar services, with potential for significant savings. 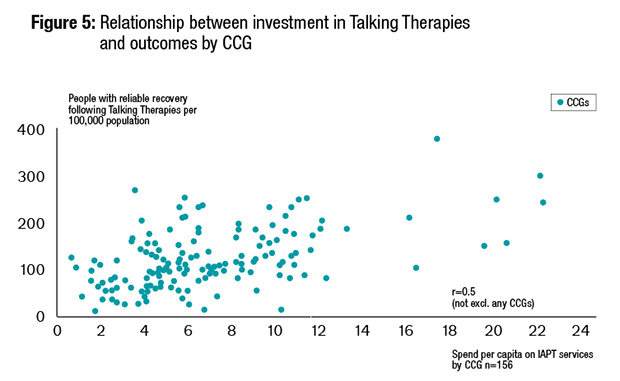 For example, the unit cost per patient of talking therapies varies from between £800 and £5,400. Evidence suggested some correlation between level of investment and outcomes. Based on our experience in the field so far, the Cost Review team has developed a simple approach to understand the costs of public services. By starting with a broad understanding and going into more detail in several areas, Cost Reviews can get you the evidence needed for reform. Start by understanding your total spend and costs. Is it just from one department or many? For example, over 20% of the total cost of mental health care is funded through welfare payments. Do the charitable and private sector also play a role? How are costs allocated across outputs of activity? How do these activities contribute to the Government’s outcomes? Next, you need to identify areas where you would benefit most from a deeper understanding, for example, where there is big variation in costs. By analysing cost-drivers, benchmarking and looking at ways of working, Cost Reviews can come up with practical recommendations in targeted areas (which – if designed properly – can be extrapolated more widely). Cost Reviews can provide evidence for how to provide better public services for less. By understanding our costs we can come up with new, smarter ways of working across Government. The team has completed a number of Cost Reviews over the last year covering diverse public services. In addition to reviews on FE and mental health, the team has examined spend on health and social care, the UK border, immigration and departures, criminal justice in London, counter terrorism, infrastructure policing and research. All Reviews are delivered in 6 to 8 weeks and, whilst the team don’t provide direct policy recommendations, they can give you the evidence-base you need to drive change. 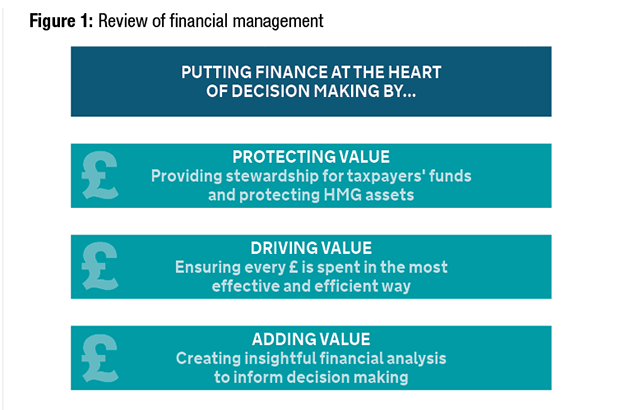 Cost reviews are focused on strengthening financial expertise across Government. Seminars run throughout this year have had very positive feedback, highlighting the wider appetite for more costing tools to use in your day-to-day work. Most importantly, this work is helping staff to improve public services, while also reducing costs. So far, the reviews have identified potential savings of up to £1 billion through reform. In light of the plans set out at the 2015 Spending Review, the team is helping officials build the evidence-base, providing the know-how to implement greater reform, devolution and efficiency in a sustainable and informed way. As this work continues, the review team’s focus will increasingly turn to capability building, creating a finance community equipped with the experience and expertise to ensure we understand what we spend and what we get for it.